Like your cuppa? Pauline D. Loh says there's a lot more to tea than what you get in the pot. TEA, coffee and chocolate (cocoa) are probably the most popular beverages in the world. But when it comes to vintage, tea leaps ahead by millenniums. Which other beverage actually has a god devoted to its cultivation and culture and an almost evangelistic spread throughout the world? Wars have been fought over tea. Empires lost. Kings and empresses toppled. Tea is as much linked to history as it is to its own definitive culture. China is the home of tea. As long as 6,000 years ago, tea was brewed and drunk in China, and the cultivation of tea on a large scale as a trade commodity began 2,000 years ago. Tea stimulated trade with the West, and in Yunnan, where tea continues to be widely cultivated, there is a historic Tea and Horse Caravan Route, which traveled right through to Tibet. Its remains of which are now major tourist destinations. When tea was introduced to the West, it became so addictive that the courts of Europe sent navigators and adventurers east to try to cut out the expensive middlemen. The rest is history, read like the tea leaves in a cup - a favorite fortune telling trick in the tearooms of Europe. Do you know your tea? Chinese tea, that is, in its purest forms. Chinese tea can be roughly classified according to the different processes it goes through in picking, fermenting and storage. This is the pure tea, dried without fermentation. 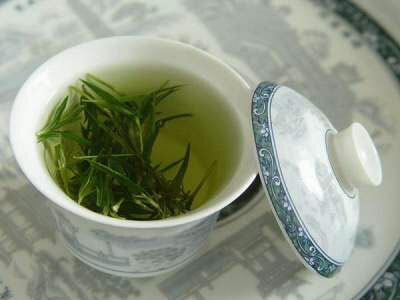 The most famous Chinese green tea is longjing, or the "Dragon Well" tea, much loved by the Emperor Qianlong (1711-1799). The best tea leaves are gathered before the spring rains in March and may cost a tidy four-figure sum per 100 grams. Other notable green teas are the maofeng of the beautiful Huangshan Mountain in Anhui province and the rare and very exclusive biluochun from Jiangsu province. This is tea which has been fermented, then heated to give its characteristic deep, dark colors. The tannins are intensified by the processes, and it is believed to be very good as a digestive aid. The best black teas come from Anhui, Yunnan, Jiangsu, Sichuan and Hunan provinces - major centers of tea production in China. The black teas are preferred by southern Chinese, and gave birth to a whole culture of eating and drinking when the Cantonese started making little snacks to accompany the tea drinking. We are talking, of course, about dim-sum and the yum-cha tradition. This is a category of tea and not the name of the tea as commonly thought. Oolong tea is a semi-dark, semi-green tea perched between the two categories but with its own very distinctive characteristics. Mount Wuyi in Fujian province is best known for its Oolong tea, and through the Chinese diaspora, Oolong was also taken to Taiwan. Taiwan, with its maritime monsoon climate, has the best terroir (micro-climate) for Oolong tea. If you are a budding investor, pay attention to this. There is a roaring trade going in pu'er tea cake futures, although it is a lot calmer than a few years ago. A single vintage block may still sell for astronomical sums. And the older the tea, the more valuable it becomes, much like a treasured vintage in wine. Originally, tea was compressed for easy transportation and storage. In Yunnan, blocks of tea were carried north to Tibet, where the tea bricks were then exchanged for sturdy mountain ponies. This was the genesis of the Tea Horse Caravan Route. Tea bricks are also produced in Hubei, Hunan and Sichuan provinces. Jasmine, magnolia and osmanthus are the most common flowers use to flavor and scent tea in the North. This type of tea, referred to as hua cha, or a flower tea, by Beijing natives, must be the favorite drink of the Chinese capital. 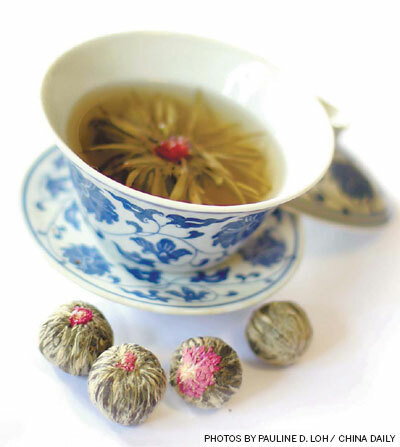 Dried flowers are added to a variety of green or Oolong teas. The varieties have expanded to include roses, marigolds and even panax ginseng buds. Tea can be drunk, but it can also be eaten. In Yunnan, Hangzhou and Mount Wuyi, where the best teas are grown, the local restaurants serve tea banquets using a variety of tea in the food. Here are a couple of recipes for you to try. The first is a tea-smoked duck that is enticingly fragrant, and is a lovely appetizer chased down with - what else but - a cup of hot, steaming tea. The Longjing Crystal Prawns is a Hangzhou specialty, and it is a more delicate dish compared to the robustness of the smoked duck. Still, it is an equally appealing dish, especially when the prawns are in season, sweet and succulent. 4. Heat up a generous scoop of oil until smoking. Quickly run the prawns through the oil and drain immediately, all of five seconds. Drain the oil and place wok back on the fire. 5. Add prawns, tea leaves and a little tea and toss well to mix. Finally, drizzle more white wine along the side of the wok to add more aroma. Plate and garnish with more tea leaves. 1. Remove duck breasts and legs. Skin and trim fat from rest of duck and chop into chunks. Reserve for soup or some other use. 2. Wash and dry duck breast and legs thoroughly and rub with Sichuan pepper and salt mixture. Wash hands well after this and do not rub your eyes. 3. Marinate duck meat, covered, for at least an hour, preferably overnight for the best flavor. 4. Line bottom of a sturdy large wok with aluminum foil. Place tea leaves, rice and sugar at the bottom. 5. Place duck pieces on a rack on top of tea mixture. Start the fire and watch carefully. When mixture begins to smoke, cover wok tightly for about 15 minutes. Switch off heat and let it continue to smoke for another 10 minutes. 6. Remove duck pieces, sear skin over high heat in a non-stick pan to crisp, slice and serve with vegetables and rice.